Waterbury Clock Co. metal cased clock, "Seine", ca 1905. Rich gold plated case retains about half of the original gold finish. 13 1/2 inch case, porcelain insert below the dial (small crack lower left corner). Cast case with sea serpents and flower swags. 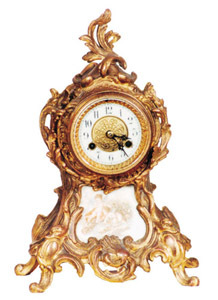 Porcelain dial, fancy gilt center, cast gilt sash and bezel, beveled glass. 8 day, half hour strike on a gong. Fancy etched movement plates and signed. Complete with the back door, runs well. Ly-Waterbury No.1239.